Our meetings at Virginia Commonwealth were awesome; at times totally civil, at other times things got really wild, but throughout it all the gospel was clearly preached and the mouths of the gainsayers were silenced. Brother Evan nearly got beaten up right at the beginning when a Deicide follower got in his face and was growling like an angry beast, but it drew a sizeable crowd and I was able to preach and defend the Word of God in a calm and orderly manner. Originally, the campus told us we couldn't come onto the grounds, which is public! 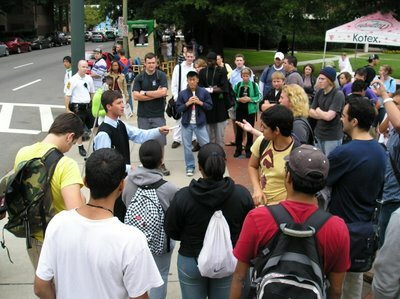 But we still had a great meeting the first day on the streets just off campus. 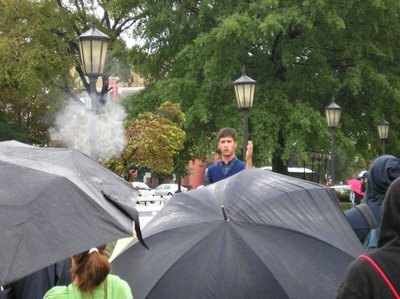 Day two was raining, but we acquired a permit and were able to set up right in the center of campus. We persevered through the rain until it cleared up and we had a fantastic meeting. The man above was a real snake. 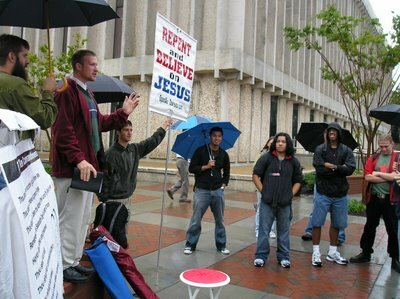 He is the religious professor at VCU and came out both days to hinder the preaching of the gospel. This man flaunted around his education, winning over the students, and blatantly lied to them regarding the Bible and certain passages of Scripture. 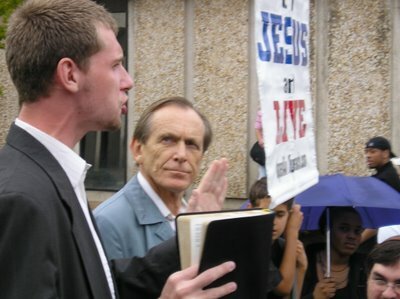 Students applauded as he assured them they must be homosexual in order to enter the Kingdom of God! However, on both days, we totally disarmed his arguments and he left the meetings defeated. This meeting lasted for hours, well into the night. Just to give you an idea of what the campus preaching tour is like, we preach at least six hours a day, five days a week, though often times more. Meetings can last up to eight hours, and we during the weekends we also preach at the bar districts in the city. This is truly full time labor; we go to work in the morning and come back home in the evening. I love it.